“Dine with the opposition.” It’s a phrase that frequents the lips of Dr. David Holt, the director of CCCU’s Middle East Studies Program (MESP). Initially, under the influence of jet lag and naiveté, I assumed that any opposition I encountered would fit nicely under labels like Israeli, Jew, Arab, Palestinian, or Muslim. This is their conflict, after all, and I was prepared to occasionally interact with them throughout the semester before boarding a plane in December to retreat to my comfortable solace with my neatly packaged ideas regarding the Middle East conflict. Little did I know that dining with the opposition would hit much closer to home. I’ve only been studying in Jerusalem for almost a month, and, while my knowledge of the conflict has grown immensely, I’m nowhere near a scholar on the subject. What I have learned, however, is that the situation is impossibly complicated and frustratingly misrepresented by American media. Even if you’re more educated on the Israeli-Palestinian conflict than I was going into MESP (which is entirely likely), a realistic grasp of the complexity of the situation is impossible without living here, hearing these stories, meeting these people, and understanding that this is real life. The beautiful thing about MESP is that it exposes students to all sides of the conflict in a variety of ways. The emphasis is placed on experiential learning instead of classroom learning, so we’re almost always out and about. In just the last three weeks, we’ve toured Old City Jerusalem, traveled to Masada, En Gedi, the Dead Sea, the Mediterranean Sea, the Sea of Galilee, Mount Carmel, Capernaum, and the Mount of the Beatitudes. In the coming weeks, we’ll travel to Jordan, Morocco, Islamic Spain, and Turkey, and we’ll do a weeklong home stay with a Palestinian family. If we are in the classroom, we hear from local PhD’s, diplomats, and professionals, both Jewish and Palestinian, about different aspects of the conflict, like Zionism or The Nakba. MESP students also have countless opportunities for non-sanctioned cultural interactions. The program directors introduced us to Palestinian students studying at Al-Quds University, and since then, I’ve attended a graduation party, browsed Jaffa Street shops, wandered through the Old City souk, all while getting to know two Palestinian girls. 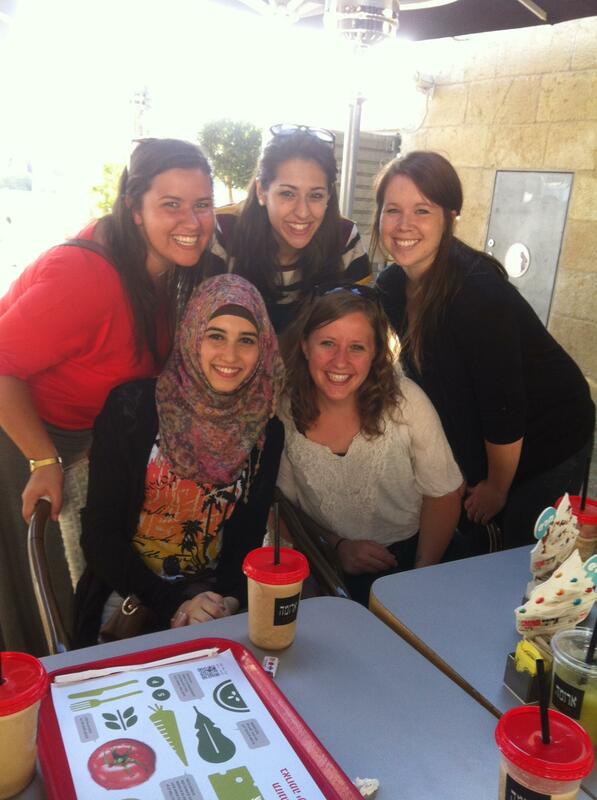 Other MESP students have gone to a Palestinian wedding and a dabka show. While engaging in all of these cultural experiences, the conflict is still constantly on our minds. We often walk the short distance to Bethlehem, and to enter we have to pass through a checkpoint on the controversial wall. We answer questions from our Palestinian friends about U.S. foreign policy, and we find ourselves asking similar questions about the U.S.’s relationship with Israel. We tour a Kibbutz, a Jewish settlement in the West Bank and wonder how a two state solution will ever be reached if Israel continues to put facts on disputed ground. We visit Yad Vashem, the Holocaust Memorial and see the rhetoric of oppression woven into the Jewish story, and we realize that anti-Semitism is still very much alive. We’ve planted ourselves on the epicenter of turmoil, and the conflict is in our faces to such a degree that we can see bitterness lining its face and smell its nasty breath reeking of fear and distrust. But, this conflict with two very compelling sides, each with their own stories of oppression, each with their own dirty hands, this is not the opposition that I face. Instead, as a child of empire, the opposition that I face while studying in the Middle East is my own preconceived notions of Arabs, Israelis, Muslims, and Jews. The opposition that I face is my very American tendency to look at this conflict and presume that I have a solution. The opposition for me is the American paternalism with which I’ve been raised, the paternalism that compels me to ignore the U.S.’s hand in perpetuating this conflict and instead look to it for a sovereign solution. The opposition with which I should dine is the internal battle propelling me to critique these cultures I’m observing instead of the one from which I originate. As I sit here, fully ensconced in this conflict of nation building, I shamefully realize how easy and natural apathy felt just four short weeks ago. Not only is MESP exposing me to a culture completely different than my own, but it has also catalyzed a difficult but fulfilling journey of critiquing myself and my own culture. So, I’ll end with a plea. Dine with the opposition, the real opposition that resides within each of you. Be it MESP or a different cultural exchange program, do something that distances you from your comfortable ideas of truth. Editor’s note: For more information about study abroad opportunities, contact Dr. Don Dunnington at the Center for Global Engagement.